Is income inequality rising or falling? The reality is complex, but by looking at recent empirical data we can get a comprehensive picture of what is happening to the rich and poor. Let’s start with the share of total income going to that much-maligned one per cent. Reconstructed from income tax records, this measure gives us the advantage of more than a century of data from which to observe changes. The blue line in the left hand panel below shows the long-term trend in the US. Prior to the Second World War, up to 18% of the all income received by Americans went to the richest 1%. Following the war, the share of the top 1% dropped substantially, increasing again in the early 1980s until it returned to its pre-war level. This U-shaped long-term trend for top income share is not unique to the US; several other English-speaking countries shown in the left hand panel followed the same pattern. After a decline in the past, inequality is now on the rise. But it’s not a universal phenomenon. The right hand panel shows that in a number of equally rich European countries, and in Japan, things developed quite differently. Just like in the countries on the left, the income share of the rich reached a low point in the 1970s, but then, rather than bouncing back up to previous levels, it remained flat or increased only modestly, giving us an L-shape on the graph. Income inequality has decreased drastically since the beginning of the 20th century so that today a much smaller share of total incomes is paid to the very rich. One lesson to take away from this empirical research is that there is reason to believe that we can do something about inequality. If there was a universal trend towards more inequality it would be in line with the notion that inequality is determined by global market forces and technological progress, where it is very hard (or for other reasons undesirable) to change the forces that lead to higher inequality. It is dangerous to believe that there is a unanimous trend to higher inequality, as this encourages the belief that growing inequality is inevitable. The reality of different trends suggests that it is not global forces that shape the distribution of incomes but the country-specific institutional and political framework. Therefore it is crucial to understand the institutional settings that allowed some countries to achieve economic growth without returning to the old levels of top income inequality. A major step in this direction is the forthcoming book from the inequality researcher Sir Tony Atkinson in which he makes concrete proposals on how to reduce inequality, based on the insights from periods in which inequality decreased. The data on top income share do not measure the share of income that reaches the pockets of the rich, but rather the gross income before taxes are paid. Yes, the rich do avoid paying taxes, and top marginal income tax rates were higher in the past, but progressive taxation still does a great deal to narrow the gap between rich and poor: in the US, 37% of the total sum of income tax is paid by the top 1%, while less than 3% is paid by the bottom 50%. The redistribution means that the incomes of the poor are higher after taxes (because of transfer payments such as pensions, child benefits, and unemployment benefits) and the incomes of the rich are reduced after taxes (due to generally progressive income tax rates). This difference between pre-redistribution ‘market incomes’ and eventual disposable income is shown in the next chart. Redistribution through taxes and transfers reduces inequality considerably. In this chart inequality is measured with the Gini index, an inequality measure that not only looks at the top of the income distribution but captures the whole distribution. We can see that market income inequality in the UK, the US, and France is fairly similar (Gini between .5 and .52) – but there are big differences in how much these countries reduce inequality by redistribution. 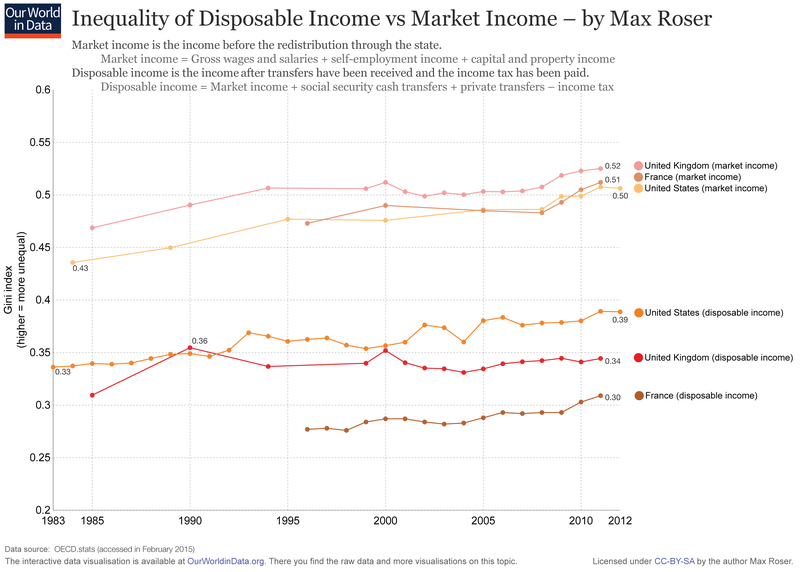 Inequality in both market and disposable income are steadily increasing in the US, and compared to similarly rich countries the US redistributes comparatively less. These data are based on household surveys, a shortcoming of which is that they under-report top incomes. Likewise, the shortcoming of the top income measure is that it is necessarily silent about what is happening within the bottom 99% of the distribution. Taking the ‘top 1%’ chart and the ‘market income vs disposable income’ charts together allows us to understand how inequality has developed. In the UK, the pre-tax share of the top 1% has been rising continuously since the late 1970s, but disposable income for all earners followed a very different trajectory, with inequality increasing rapidly in the 1980s but not changing much since then. If anything, income inequality has actually fallen in the UK over the last 25 years. In summary, the incomes of the poor in the UK are growing as fast as the incomes of the rich, apart from the top 1%, whose incomes are racing away. Before we turn to the global income distribution I want to shift the focus from Europe and North America down to South America. 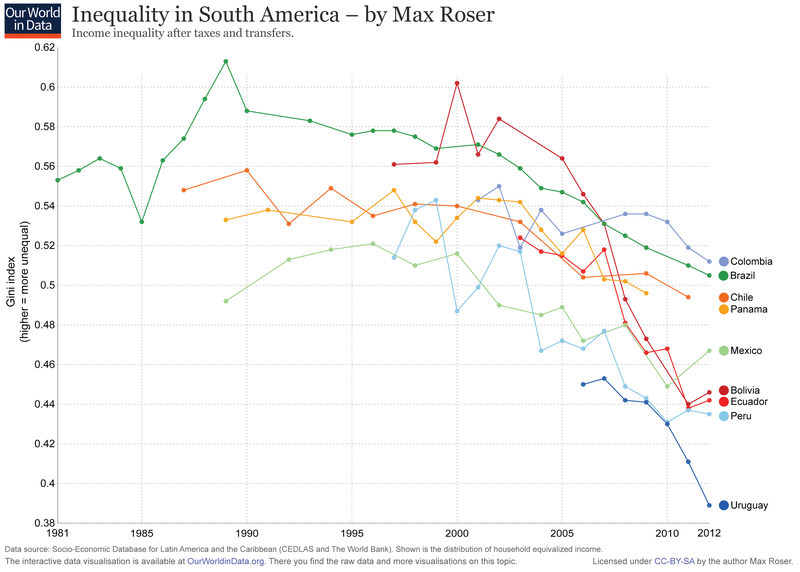 In all of the South American countries shown in the following chart, income inequality has fallen since the year 2000. It is shown in the chart for the bigger South American countries (and it can be studied for the other countries on OurWorldInData.org here). Rapidly falling inequality in South America that lifts millions out of poverty is a huge success, and demonstrates once again that there is not one simple answer to whether inequality is rising or falling within individual economies. We’ve looked at the changing income distribution within countries but what about the global picture? The chart below shows income estimates for the world in the year 1820, adjusted, as always, to take account of inflation and price level differences between countries. Two centuries ago no country in the world had a life expectancy over 40 years, and even in relatively rich countries like England and France the poor were so malnourished and weak that they were effectively excluded from the labour force. The share of the world population living in absolute poverty was estimated to be around 90%. Over the next 150 years some countries achieved economic growth while others remained poor. While Europe and the European offshoots in North America and Oceania grew rapidly, most of Asia, most of Latin America and all of Africa remained poor. The consequence of this was a hugely unequal world. 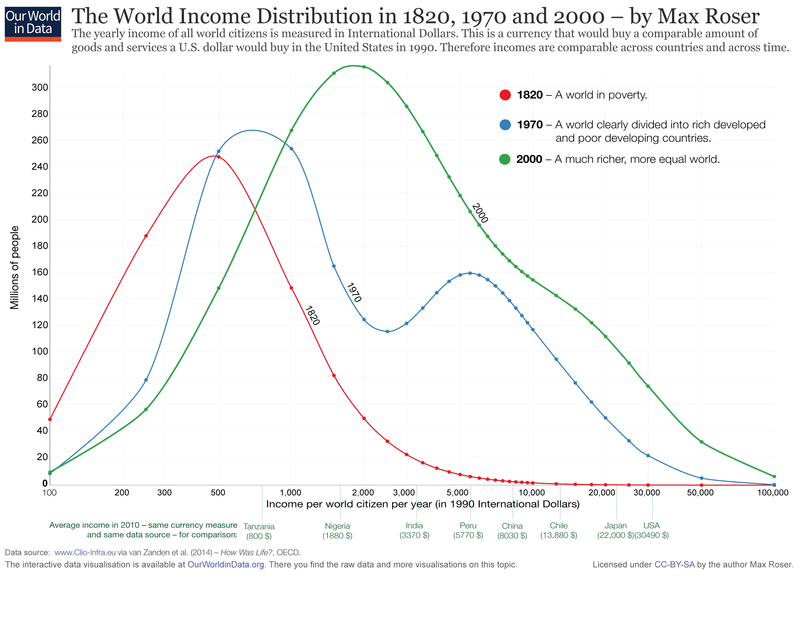 The bimodal (“two-humped”) blue line for 1970 shows the world income distribution of a planet clearly divided into rich and poor countries. Since the 1970s the world has changed. The circle of countries achieving economic growth includes much of Asia, Latin America, and for the last two decades also includes Africa. The consequence of this is that global poverty is falling faster than ever before – the share of the world population living in poverty has decreased from over 50% in 1981 to 17% in 2011. 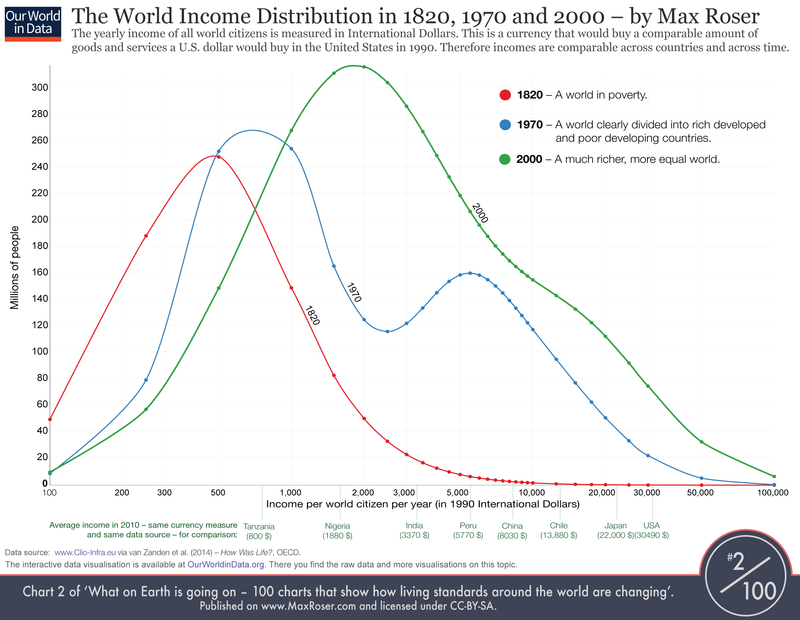 Because of rapid growth in formerly poor countries, the world income distribution has changed dramatically. The bimodal distribution of very high inequality across countries in 1970 has changed into a unimodal distribution of lower inequality today. The latest research on this question shows that the Gini index for global inequality has fallen from 72.2 in 1988 to 70.5 in 2008 (the last year for which we have data). While there is no reason for complacency, it’s a fact that global poverty is falling faster than ever before, with the share of people living in poverty decreasing from more than 50% in 1981 to 17% in 2011. There is still a long way to go to improve living standards for the world’s worst-off, but we can take a clear and heartening message from the data: global income inequality is falling and global poverty is in decline. If you are interested in long-term trends of living standards around the world follow me on Twitter where I share many data visualisations of long-term trends from my web publication Our World In Data. Secondly, there are benefits of falling global inequality for the entire world with benefits for people in rich countries. To see how decreasing global inequality is helping us all it is useful to think about a problem that we would want to solve. The principle applies for all pressing problems we are facing – from energy generation to public policies – but for the argument let’s take a potentially deadly disease as an example: If you had to choose, would you rather have a disease that many other people are suffering from or would you rather have a disease that only few others have? The answer is obvious: Since there is more demand for solving the common disease there will be better research and better treatment for this disease and your chances of finding a cure for the common disease are better. The chances to find a solution for a problem rise with the number of people that demand a solution for this problem. This logic also applies to the world as a whole: In the highly unequal world of the past the demand for innovations to solve our problems could only come from the small circle of better-off countries. The vast majority of our poor ancestors were effectively excluded from raising the demand for their problems. Today in a richer, more equal world there is increasingly more demand for innovation from an increasing number of richer people from around the world. A world in which more people are seeking solutions for the problems we are facing will innovate and progress much faster – a development from which everyone benefits. But there is more to it. The second aspect is the supply side. A more equal world – with a world population that is much better educated – has also much more potential for delivering the innovations we are looking for. Many of the technological innovations of the past came from the small circle of rich countries. In a more equal world there is an increasing number of engineers, social scientists, doctors and entrepreneurs from all over the world who are capable of delivering the solutions that we are looking for. In a richer and more equal world the demand and the supply for human ingenuity is increasing – and this is a development from which all of us will benefit. The outlined logic of course also applies to what is happening when inequality is increasing. And this thought brings us back to the observation that in some countries – most dramatically in the US – inequality is increasing. When a larger share of the population is excluded from demanding and delivering the solutions that we all are looking for, we are eroding our potential to innovate and progress. The distributional question is central to the effort of improving living conditions. Update in January 2019: This text is now almost 4 years old and a lot has changed since then. We are now working on Our World in Data as a team and the coverage has increased very substantially and the web site has improved. Have a look at OurWorldInData.org to see for yourself. www.OurWorldinData.org is a new web publication that portrays the social, economic, and environmental history of our world up to the present day. The content is based on empirical data which is visualized in interactive graphs and maps. The online publication shows how living standards around the world have changed and covers a wide range of topics: Trends in health, food provision, the growth and distribution of incomes, violence, rights, wars, education, the environment and many other aspects are empirically analyzed and visualized. Covering all of these aspects in one resource makes it possible to understand how the observed long-run trends are interlinked. The freely available web publication is used by academics, journalists and entrepreneurs. The interactive visualizations – licensed under a permissive CC license – are directly usable for journalists (who can either copy the visualizations or directly embed them in their web publications). For entrepreneurs it is important to understand how the world is changing to understand future developments and see new opportunities. Academics use OurWorldInData.org as a starting point for their own research since the website catalogs exhaustive lists of data sources for each topic – the website is in this sense a database of databases. Lecturers access the web publication because the visualizations can be directly used for the preparation of their teaching material. I have chosen some visualizations of long-term trends to give an idea how our world has changed. It is only a small excerpt but it shows the range of different aspects covered in OurWorldInData.org. Since the onset of industrialization the share of the world population living in absolute poverty is declining. More than 80% lived in poverty in the early 19th century. For the last decades we have estimates of the share of the world population living with less than 1.25$ per day (the international poverty line used by the World Bank). From the chart we see that according to this measure about half the world population was still living in poverty in 1981. Since then poverty has been declining more rapidly and the share of the world population living in absolute poverty was down to 21% in 2010. This is no reason for complacency but it is clear that the trajectory of change is pointing in the right direction and that the world is changing very fast right now. Income is a very important aspect but there is more to a good life than material prosperity. One of the main motivations of OurWorldInData.org is to show how life around the world is changing in a broad range of aspects. And maybe even more astounding than the improvement in global prosperity was the improvement in global health. The maps below show estimates of life expectancy for the last 200 years. In the pre-modern, poor world life expectancy was around 30 years and when poverty started to fall life expectancy started to increase in the early industrialized countries. This led to the huge global inequality shown in the second map: good health in the rich countries and persistent bad health in those countries that remained poor. Over the last decades this global inequality decreased substantially. Countries that not long ago were suffering from bad health are catching up rapidly. And today no country in the world has a lower life expectancy than the the countries with the highest life expectancy in 1800. The increase in life expectancy was predominantly due to changing mortality at a very young age. The interactive map below visualizes child mortality (the number of children dying before their 5th birthday per 1,000 live births) between 1950 and 2012 – you can change the visualized data by clicking on the year in the top row. A decrease of child mortality leads to a reduction of inequality of life expectancy. This means that the reduction of global inequality of health went together with a reduction of inequality of health within countries. But progress was not confined to an increase in material living standards and the health of the population. Progress also encompasses the interpersonal relations. The following graphs shows the long-term decline of interpersonal violence. And in addition to a decline of violence we have witnessed an increase of political freedom over the course of the last decades. This change – from a world in which around 10% of the world population lived in democracies to a world in which more than 50% live in democracies – is visualized in the following chart. Click on ‘Expanded’ to change the perspective to the share of people living under the different political systems. Looking at the long term trends makes it also possible to see the challenges we are facing and to see where things are not getting better. In a sea of hysteria it is hard to hear the important warnings and to point out the issues that truly matter. One of the aspects that rightly trouble us is economic inequality. The following two charts show that industrialized countries saw a substantial reduction of income inequality over the course of the first half of the 20th century – for several decades the poor got rich faster than the rich. But this is not true anymore: In Europe and Japan inequality is not falling anymore and is moderately increasing some countries. 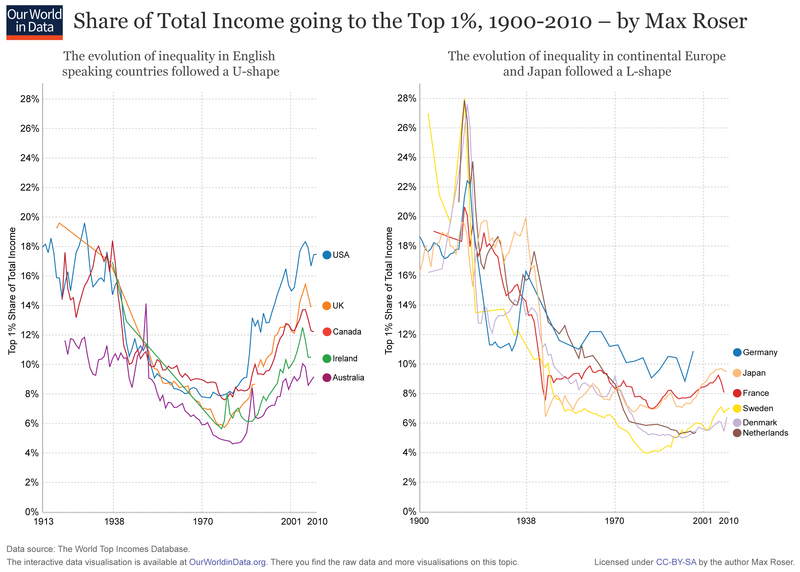 And in the English speaking countries shown in the second chart we see a significant increase of inequality and a return to the high levels of the early 20th century. OurWorldInData.org also covers environmental trends. Here the long-term picture is mixed: Some aspects get worse – while some get better. The following graph shows the little known fact that oil spills are becoming less and less common. Why do we publish OurWorldInData.org and where do we want to go with this publication? The empirical evidence overwhelmingly shows a world of rapidly improving living standards. Because our hopes and efforts for building a better future are inextricably linked to our perception of the past it is important to understand and communicate this historical development. Studying our world in data and understanding how we overcame challenges that seemed insurmountable at the time should give us confidence to tackle the problems we are currently facing. It is easy to be cynical about the world and to maintain that nothing is ever getting better. But fortunately the empirical evidence contradicts this view. We believe it is partly due to a lack of relevant and understandable information that a negative view on how the world is changing is so very common. It is not possible to understand how the world is changing by following the daily news – disasters are happening in an instant, but progress is a slow process that does not make the headlines. We believe it is important to communicate to a large audience that technical, academic, entrepreneurial, political, and social efforts have in fact a very positive impact. OurWorldInData shows both: It highlights the challenges that lie ahead and it shows visually that we are successfully making the world a better place. The demand for the web publication greatly exceeded our expectations and the feedback has been fantastic. Although OurWorldInData is only available for 3 months there were more than 120,000 people on the website. It is still work in progress, but if we can attract funding for this project we can develop this freely available web publication further and expand OurWorldInData over the coming months. Follow Oxford economist Max Roser on Twitter to be up to date: @MaxCRoser. Indoor air pollution is by far the biggest environmental problem of the world. Every year, 4.3 million people die due to the exposure to household air pollution caused by indoor open fire. To bring this in perspective: This is 45-times the number of the global annual deaths from natural catastrophes (±95,000 in the 2010s). And much more than twice the number of people dying because of AIDS (1.5 million in 2013). It is probably the most unreported of the world’s big problems. The burning of solid fuels fills the houses and huts in poorer countries with thick smoke that kills the world’s poor by causing pneumonia, stroke, heart disease, chronic obstructive pulmonary disease, and lung cancer. It is predominantly women and young children who are killed by indoor air pollution. The solid fuels responsible for this include wood, crop residues, dung, charcoal, and coal. The solution for this problem is straightforward: shift from solid fuels to modern energy sources. And the chart shows that we are making rapid progress in this direction. 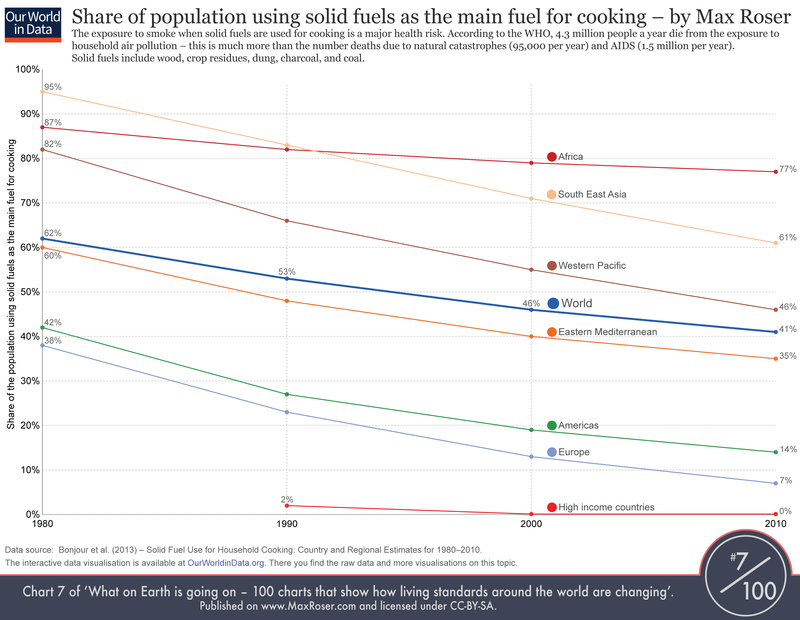 In 1980 almost two thirds of the world’s population used solid fuels for their cooking. 30 years later this is down to 41%. The chart also shows that it is a problem associated with poverty: In richer Europe and North America the share is much lower than in the rest of the world; and in the high income countries of the world the use of solid fuels is entirely a thing of the past. The use of solid fuels is going down in all of the world’s regions. But the success rapidly developing South East Asia is particularly impressive: Here the share fell from 95% to 61%. This is part of my 100 chart project. These data are taken from Bonjour et al. (2013) – Solid Fuel Use for Household Cooking: Country and Regional Estimates for 1980–2010. Environ Health Perspect; DOI:10.1289/ehp.1205987. Online here. The data (by country) is available in the supplemental material document which is online here. The authors are Sophie Bonjour, Heather Adair-Rohani, Jennyfer Wolf, Nigel G. Bruce, Sumi Mehta, Annette Prüss-Ustün, Maureen Lahiff, Eva A. Rehfuess, Vinod Mishra, and Kirk R. Smith. Countries are grouped by WHO region and income category (WHO 2012e; see Supplemental Material, Table S2). You find this chart and much more information about this topic in the data entry on indoor air pollution. On the y-axis we measure the number of annual live births per 1,000 people. On the x-axis we measure how many infants, who were born alive, survive their 1st year of life – this is the infant survival rate. 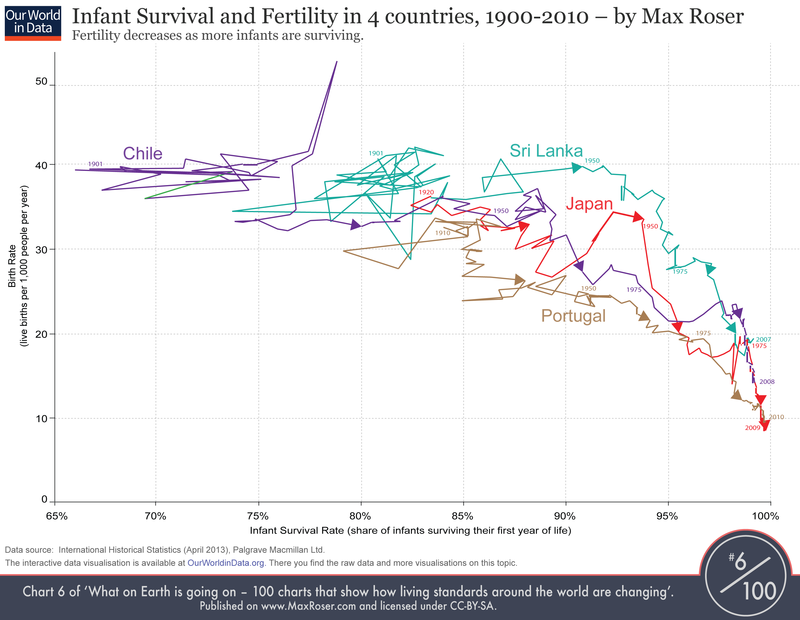 The chart shows how these two aspects changed over the course of the 20th century: At the beginning of the century all 4 countries can be found in the upper left corner – they are characterized by high fertility and an infant survival rate below 85%. If we follow the 4 lines we are taken to the bottom right corner and see that women have fewer children when the mortality rate of babies goes down. The causal link between infant survival and fertility is established in both directions: Firstly, increasing infant survival reduces the parents’ demand for children. And secondly, a decreasing fertility allows the parents to devote more attention and resources to their children. This link between fertility and child mortality is an immensely important insight and tells us what drives the acceleration and slowdown of population growth: In the initial stage of the transition, when fertility rates are still high but health is already improving, the population starts to grow. But then, a bit later, we see that this transition works to decrease population growth since improving health of the children leads to lower fertility. It is an important part of the mechanism behind the demographic transition. A very cynical view – that I heard more than one time as a reply on my twitter – is that a decrease in child mortality is bad for the world since it would contribute to the overpopulation of the planet. The chart above shows that this opinion is not just contemptuous of human life but plainly wrong: When more infants survive fertility goes down and the temporary population growth comes to an end. If we want to ensure that the world’s population increase comes to an end soon we must work to increase child survival. The data is taken from the International Historical Statistics (IHS), edited by Palgrave Macmillan Ltd. (April 2013). The online version is available here. As a printed version it is published by Palgrave. The child survival rate is calculated using the IHS Data ‘Deaths Of Infants Under One Year Old Per 1,000 Live Births’. You find this chart and much more information about this topic in the data entry on fertility.